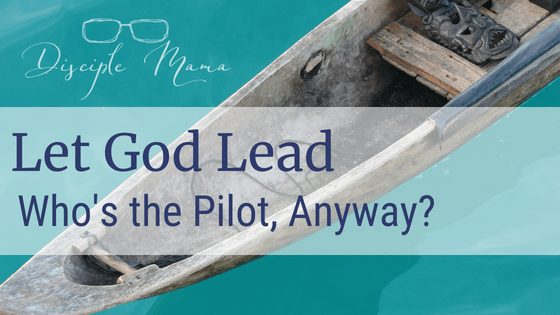 Let God Lead-Who’s the Pilot, Anyway? 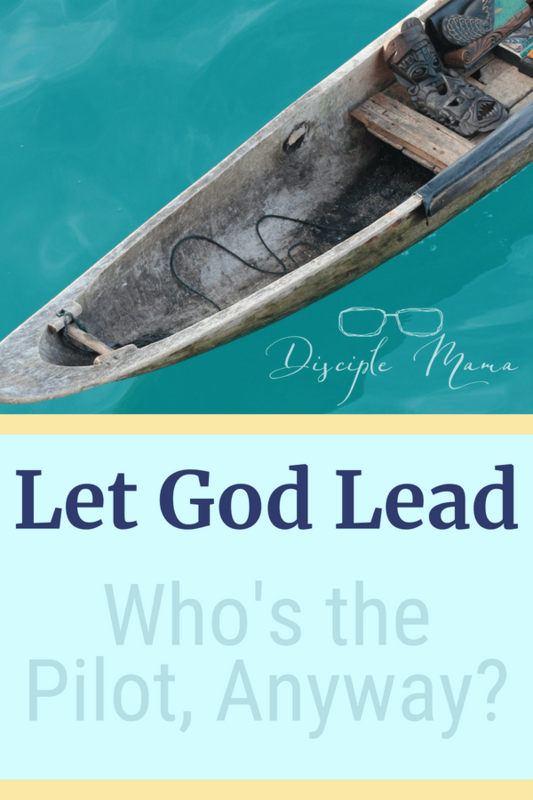 We know we should let God lead in our lives, right? But why is it so difficult? Last week was a tough one for me. Not my-life-is-over difficult, but it was tough. I cried a lot, and I’m not much of a crier. I wasn’t feeling great physically, I was hugely disappointed over a matter of prayer that I felt hadn’t been answered in the way I was hoping, my two year old was acting out more than usual (we’re talking serious tantrums) and my home was in chaos (partly out of my control, and partly my own fault). I’m feeling better now, but honestly, not too much has changed. I’m away from home right now, and vacation is definitely helping. BUT, there’s a mess waiting for me, my prayer still hasn’t been answered definitively, and we’re not out of the woods yet, tantrum-wise. I’m not feeling perfect peace, but I’m getting closer to it. The more I’ve been able to let go of things and give them to God instead of hanging on and trying to fix it all myself, the better I’ve felt. When I loosen my grip on the things I want to control and let God lead, things go a lot more smoothly. When I was a kid in a little Christian one-room school, we had worship every morning to start the day. We would always sing, and one of our favorite songs was “Over the Sea.” It had a special set of motions to do while we were singing and we loved it! I hadn’t sung the song in years until Baby A was just a few months old and crying inconsolably. Somehow that old song popped into my head, and I held his hands to do the motions and he stopped crying. I sang it to him over and over again that afternoon, and kept thinking about how the words had NEVER made sense to me–not as a kid, and even less now. Yeah, it’s a strange song. Except then I had this aha! moment (yes, in my mid-thirties I finally figured it out), and realized that all my life I’d been singing the song all wrong. I mean, the way I was singing it SOUNDED right, but it was not. The revelation came to me instantly as I was sitting there alone in a room with my baby, and I turned bright red and looked around as if someone might’ve witnessed my sudden internal awakening to the real lyrics. All my life I’d been thinking how weird it was that someone wrote a song about being Jesus’ pilot, how crazy the syntax of the song was (it drove me a little nuts even as an elementary schooler), and how it was even weirder that my teachers and church leaders didn’t think any of that was an issue (theological or linguistic). In reality, though, it was just me who was crazy. But though I could’ve gotten away without anyone knowing about my made up lyrics, here I am making public admission of my ridiculous mistake because it exactly illustrates how I do life sometimes (and you might do this, too). Sometimes I live life like I’m the pilot and I have the control. I like the control…until something goes wrong and I’ve got to call in Jesus to save me. When he does, I go sailing on my merry way, never letting God lead, never relinquishing the steering wheel, over the jasper sea. Really, though, I need to be living life like Jesus has saved me and IS saving me by being my pilot. The steering wheel is not mine to touch! 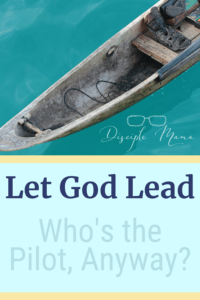 Of course, all that is easier said than done, but going forward I’m resolved to be more intentional about letting God lead, and not trying to go the other way around. Maybe that’s not an area you struggle with, but for me it really is. If it’s an issue for you, I would love it if you’ll join me in handing control back over to the One to whom it belongs. My siblings and I have a few songs we found out, recently, we’ve all been singing it wrong! It’s funny how we do that. I really enjoy reading your posts. They are encouraging and inspiring. I appreciate how real and open you are. Struggling to let God be in control is something I can relate to. Many times, like the tough time you shared here, I feel like everyone else has it together but me and my kids. This is a good reminder that even the ones who inspire us struggle through tough times, and their kids have tantrums, too. I will join you in handing control over to the One to whom it belongs. Oh, I had a lot of songs that I sang all wrong (and I probably still have some I haven’t discovered, yet!). It’s crazy how if you never see something written down you don’t always realize your mistake! Thanks for being real and open and sharing right back with me! I think we’re all struggling in one way or another, and it just seems that everyone else has it more together. I just think it’s best to be honest about what we’re going through and that way we can support each other. It’s a daily decision to hand over that control. Some days it’s easier than others.